That's right this post is for my sister-in-law Gina. She made mention a while back that she likes to see some of the pictures of our work at work. I love to stamp and wish it were my full time job, but it's not. 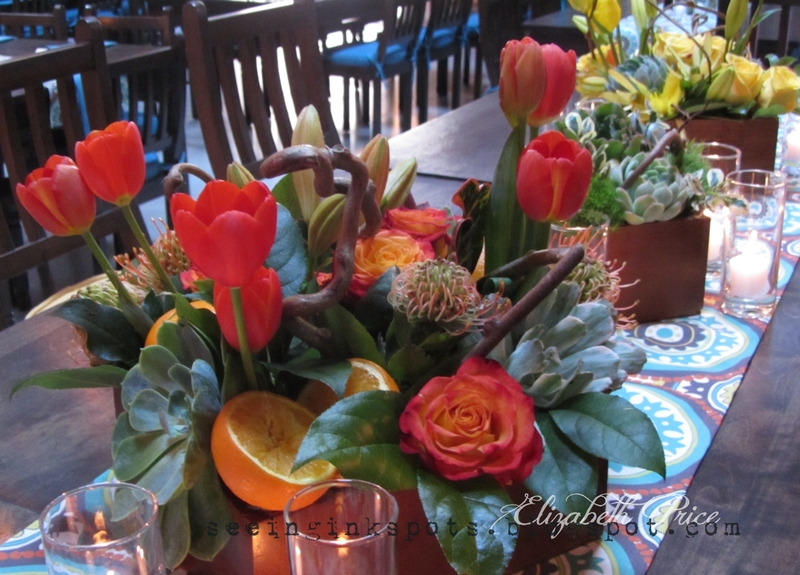 I work for a, not your average, florist called Bloomster's, you can see lots more on our Facebook page and website. 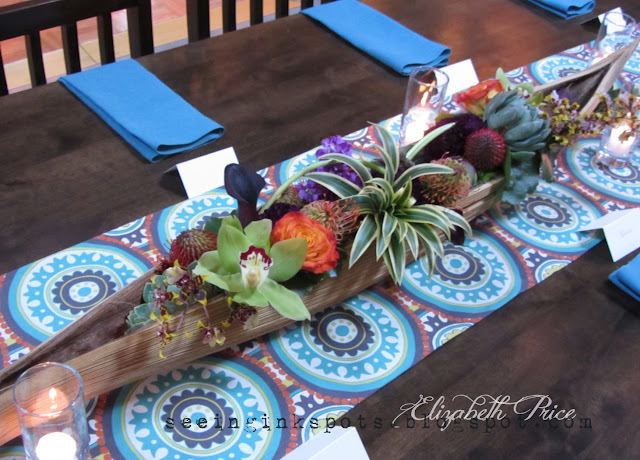 We are lucky to do AMAZING floral designs, landscaping, event decor, interior decor, and holiday decor for businesses and private residences. I focus most of my work on event design and coordination and we do on average five to six events a week, sometimes we do that many in a day. I call those days "bring your friend to work days." The photos I am sharing today are of a wedding we did in early February at a venue called Dogpatch Studios in San Francisco. 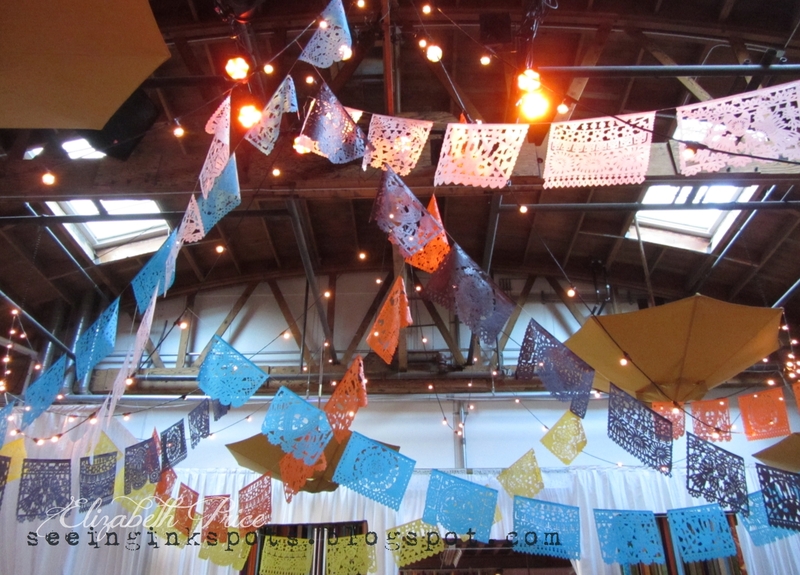 We completely transformed the film studio into a Mexican plaza for a super sweet bride with tons of style. I wish I had professional photos, but I don't so I will share my pics from my pocket camera. This first picture of the cocktail hour bar SO does not do the look justice and the colors are wonky, but the entire area was so cool. I made all those medallions and must have used over 100 pieces of non SU! 12" x 12" card stock. And can I say "not all card stock is created equal. 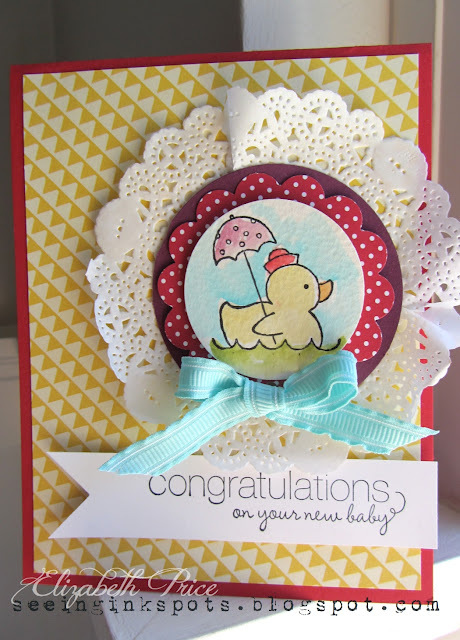 Buy Stampin' Up! it's WAY better." The second photo is of one of the cocktail hour tables. 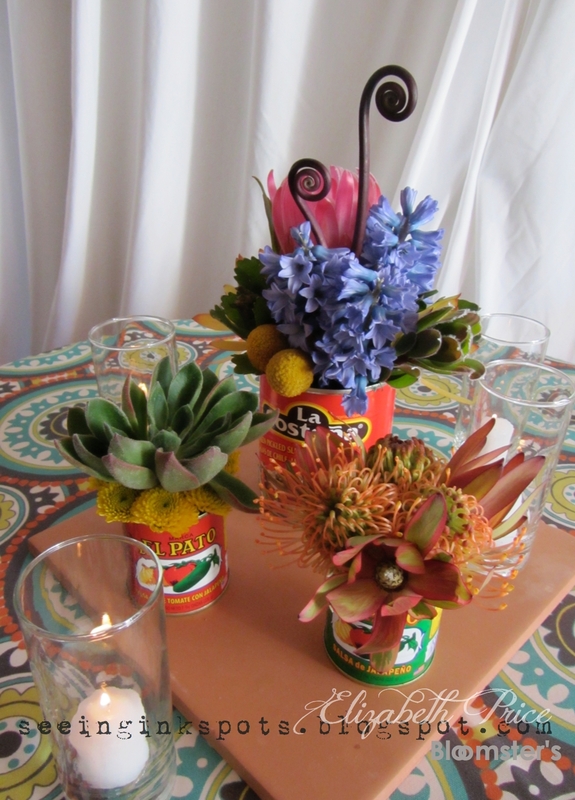 These were so festive and with the florals being designed in the cheapest containers ever! They looked super fab. 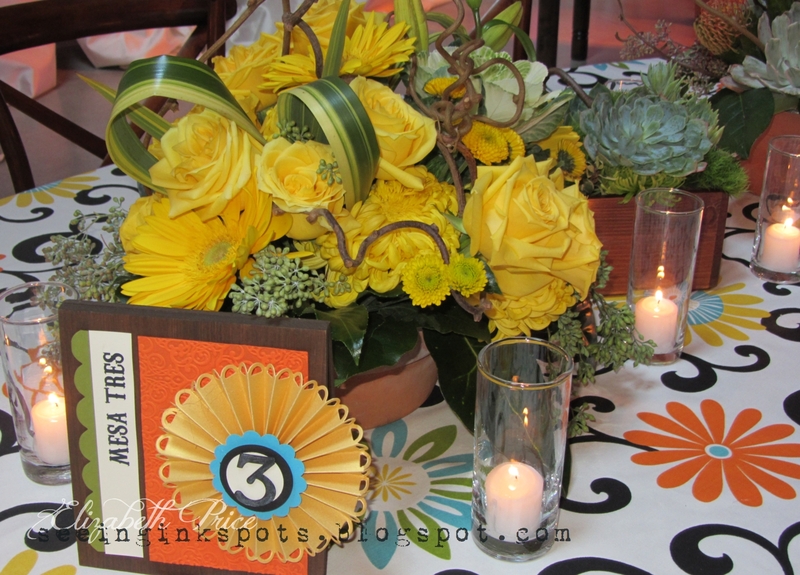 For the main reception the bride wanted round tables, tall square tables, long farm tables, and even oval tables. So for those we designed a collection of centerpieces in stained wooden boxes, terra cotta vessels, and palm husks. For a much more exciting look we incorporate a series of complementing floral designs to create a custom dramatic look rather than mass produced presentation. 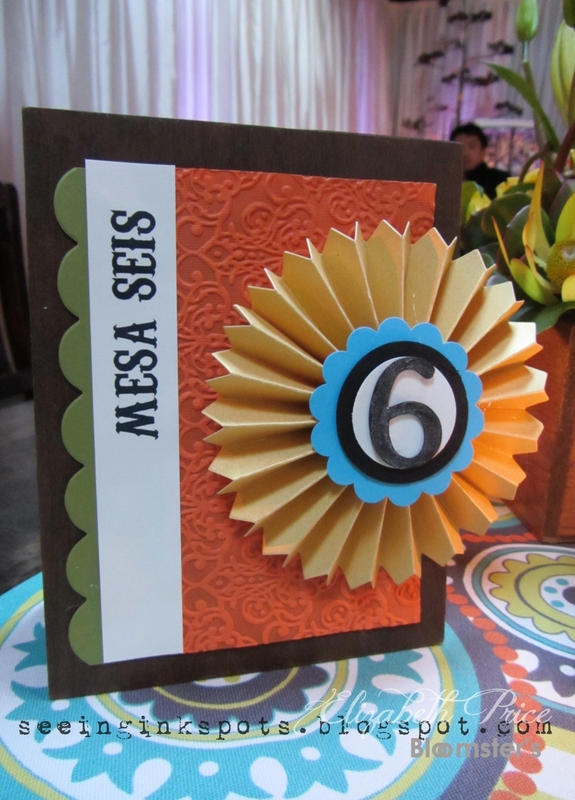 I made all the table numbers on miniature wood stained sandwich boards. I used the Lacy Brocade TIEF, Typeset Alphabet Bigz Dies, and the Designer Rosette XL Bigz Die along with the Tasteful Trim XL Bigz Die. What I don't have is any pictures of the bus that brought all the guests, including the bride and groom, from the ceremony to the reception. I made HUGE tissue paper flowers, 38 to be exact, to decorate the inside and outside of the bus. We also had a sign that hung on the back of the bus that said "Recien Casados (Just Married)." 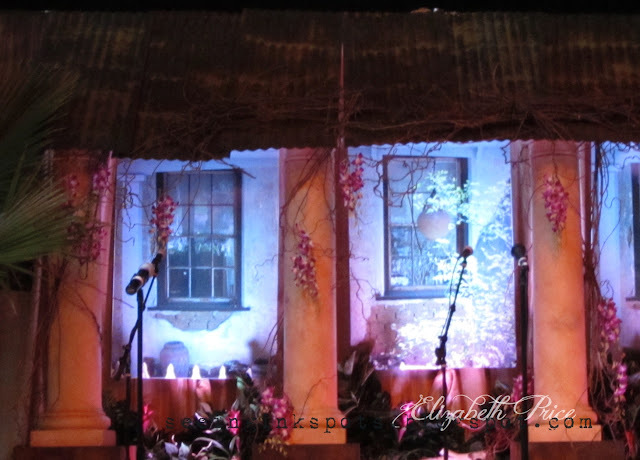 For a focal to the reception we constructed a facade. We started with some photos I took of an old adobe home in New Almaden, an early mining community of San Jose, and built a corrogated roof over columns. 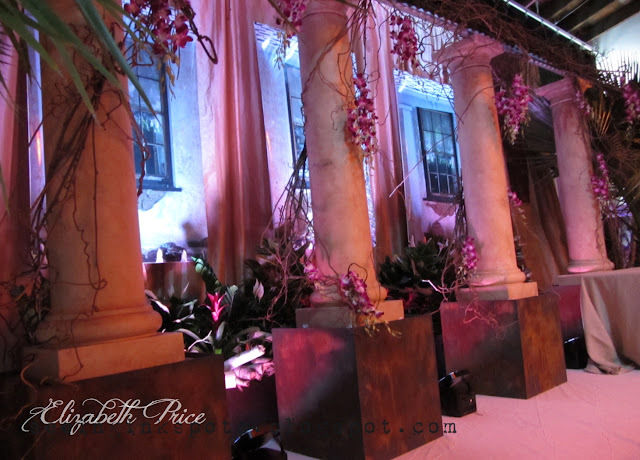 We added kiwi vine and orchids along with bromeliads and palms to finish the look. This was AMAZING. I only wish I took the photos before the band arrived and started setting up their equipment. 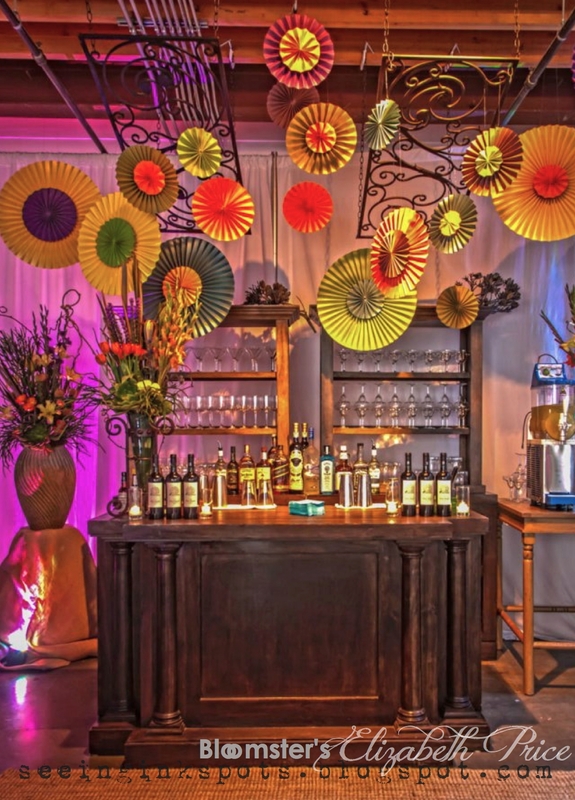 Throughout the ceiling we strung market lighting, oversized umbrellas, and papel picados in a variety of the brides colors. I wish I had a picture of the entire room, but I don't, but it truly was fabulous. I have had this card in my stack of pictures to share on my blog for a long time. We made this back in February and while the stamp set Patterned Occasions is not available the layout is perfect for a 4 1/4" square card. You can see my photo tutorial on how to make the perfect paper bow here. 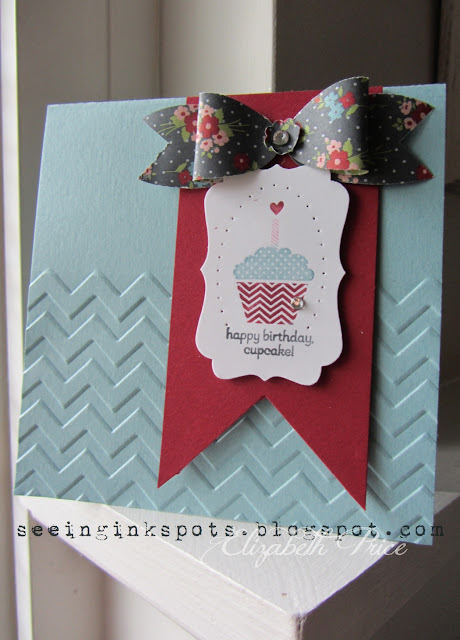 To highlight the cupcake I added an oval paper piercing detail and a single Basic Rhinestone. 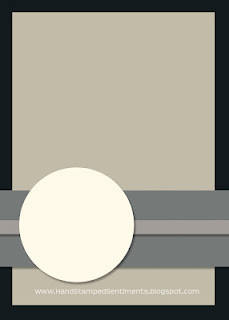 My colors are Baja Breeze, Cherry Cobbler, Whisper White, and Twitterpated DSP. Man oh man I just am drawn to the combination of Summer Starfruit and Pool Party. I have used it lots lately and can't seem to get enough. I also again gravitated to my number one embossing folder, Framed Tulips and as always it was preinked. And to be totally honest preinked because I didn't clean it from the last time I used it. It seems to be permanently inked with Crumb Cake because it works with everything. Speaking of inking there is lots of inking on this card. I inked up the dress form with two colors, pool party and crumb cake, and I inked up the bird with Summer Starfruit in the shadow lines and Whisper White on the tops. Get it while you can. The awesome greeting stamp set called Word Play is being retired in just a few days. 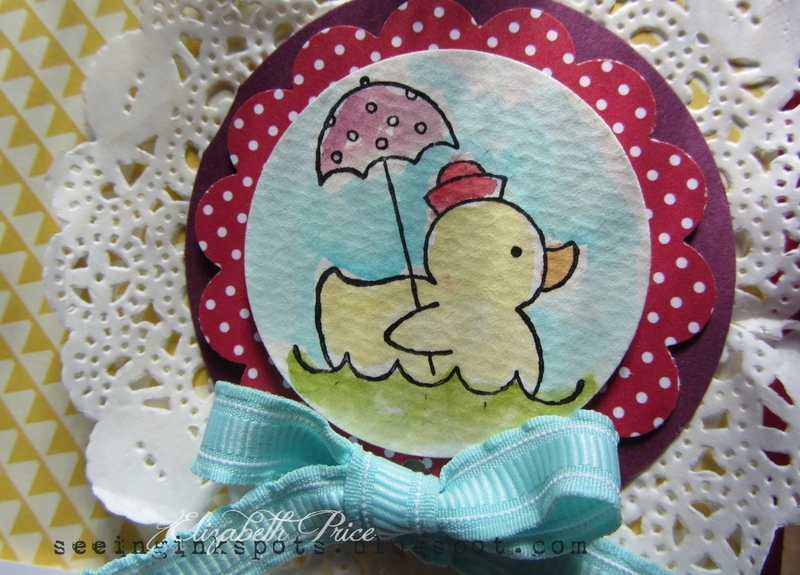 I have featured my favorite image from the set for the sketch challenge featured at Hand Stamped Sentiments. I decided to flip the sketch to fit the feel of the word wish which is italicized. I also used my favorite use of inkin' up with markers. 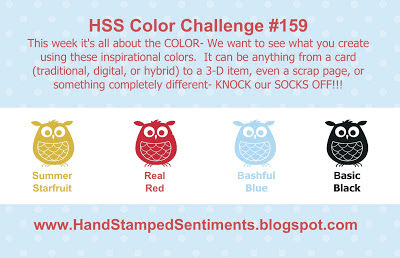 My marker colors are Rich Razzleberry, Lucky Limeade, Daffodil Deliight, and Island Indigo. 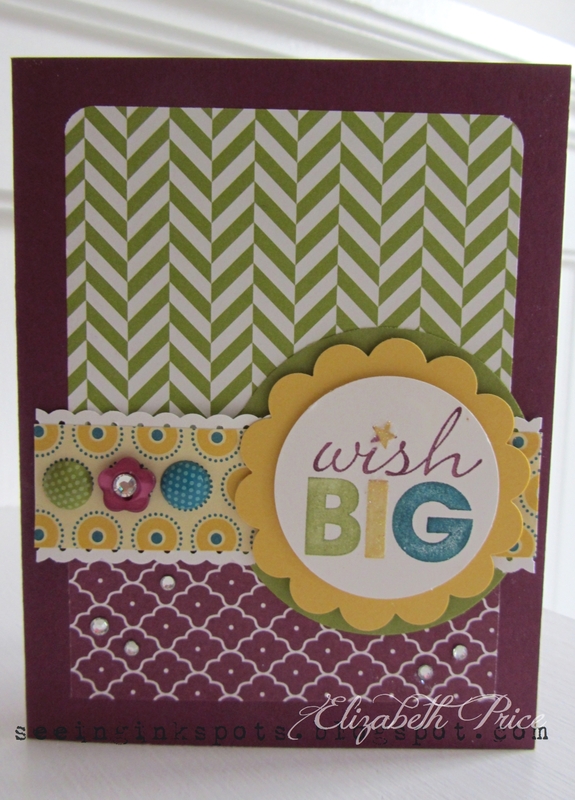 The DSP is Summer Smooches and the card base is Rich Razzleberry. My finishing touches include Brights Buttons, In Color Printed Brads, and Basic Rhinestones. Click here to learn what fun you can have when you kit arrives once a month. 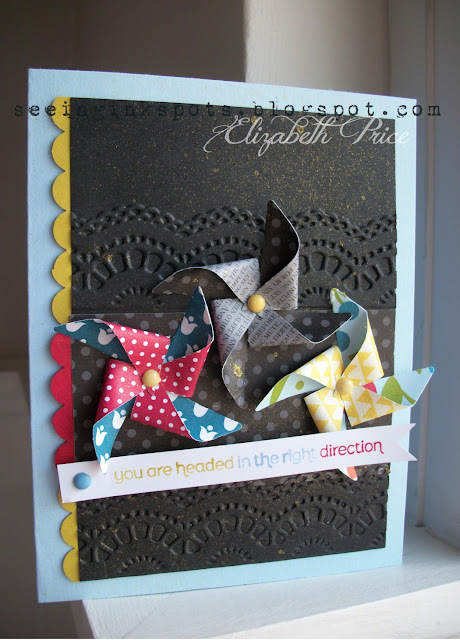 Be sure to select me, Elizabeth Price as your Stampin' Up! Demonstrator. 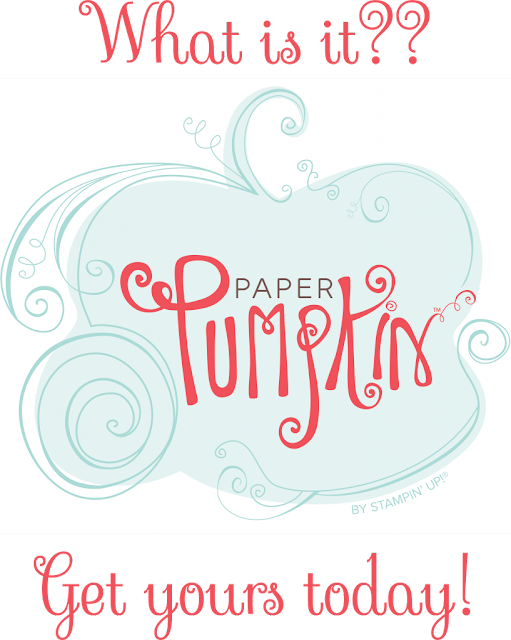 Get your Stampin' Up! fabric while you can. The beautiful prints will be available while supplies last up until May 31st. For this card I used some snipped and ripped scraps of Twitterpated with bits and pieces of ribbons, twine, and trim. I started with a Crumb Cake card base and then added a panel of Baja Breeze embossed with the Tulip Frame Folder, preinked of course because I can't get enough of that technique. 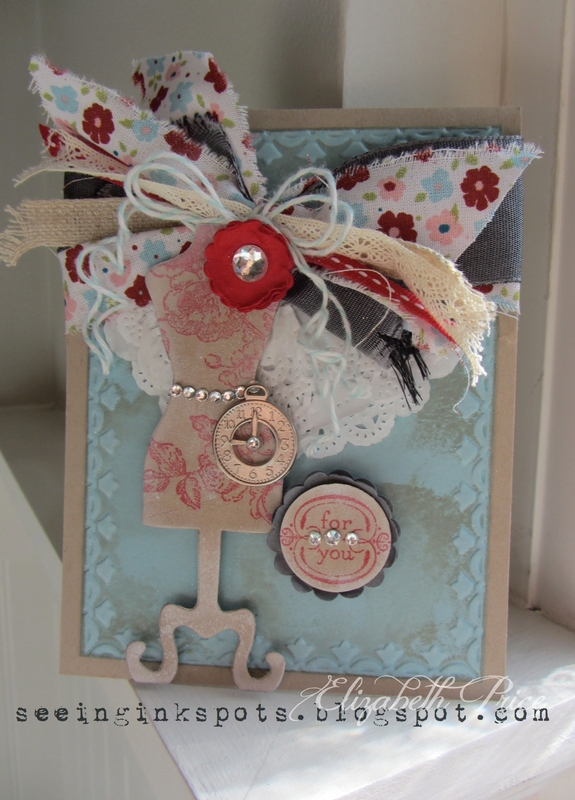 A Tea Lace Doily for an added layer, a Dress Up Framelits dress form stamped with the rose image from Elements of Style, and a circle greeting from the same set create the focal point for the card. I totally love the HUGE belt made with Basic Rhinestones and a Tea Time Trinket. 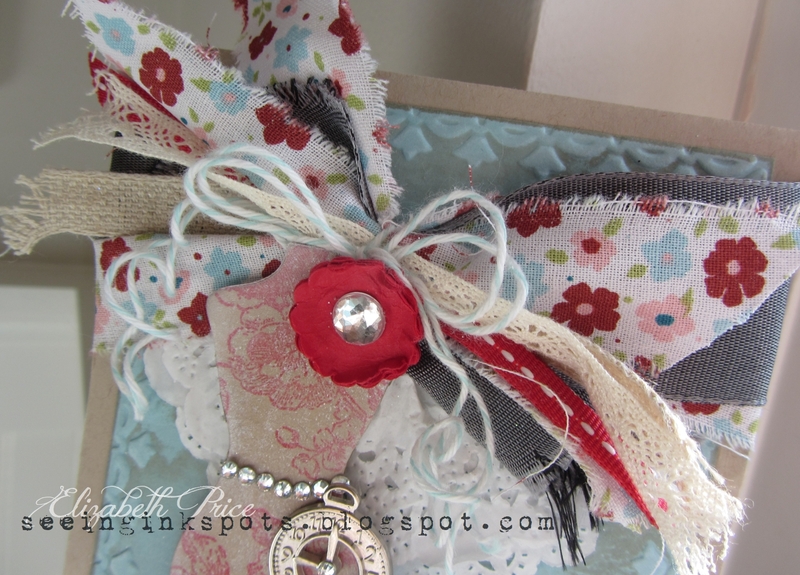 I hope you like my funky shabby fabric and ribbon scrap card. 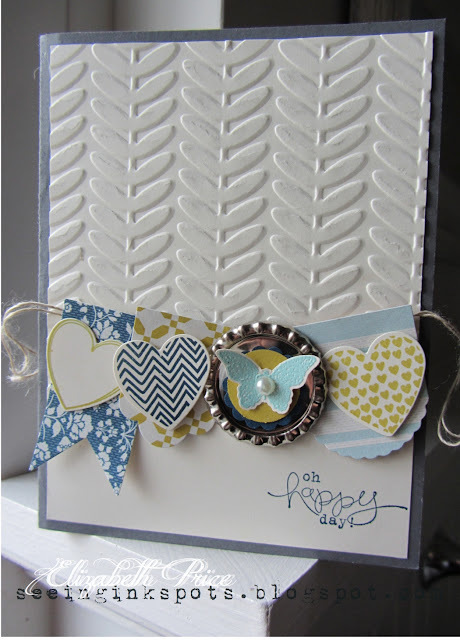 With a great set of framelits, Hearts a Flutter, and a striking embossing folder, Vine Street, you can make a pretty card to make someones day. 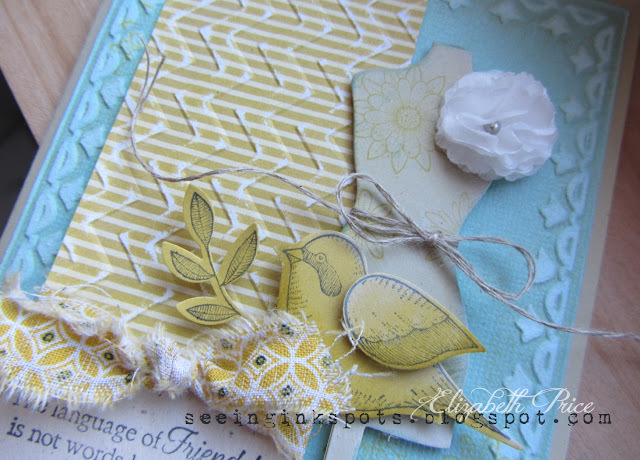 I turned to the Comfort Cafe DSP and two stamp sets, Hearts a Flutter and Bloomin' Marvelous to create my card. I love the flattened soda pop top layered with a 7/8" scallop circle, a 3/4" circle, an embossed butterfly, and a pearl. Fake it 'til you make it! That's right and that's me when it come to tap dance and watercoloring. However, with the right tools and supplies I can wade my way through watercoloring something sweet, fresh, and fun with ink, a paintbrush, a little water, and WATERCOLOR PAPER. What a HUGE difference the paper makes. I can't say it enough. This is another one of those cards that I put together with odds and ends laying about my table. For me I love that the colors are whimsical, bright, and a mix of soft with saturated tones. I started with a stamp from Easy Events and a Jet Black Staz On ink pad. Then a few whisps of ink picked up from the lids of Daffodil Delight, Pool Party, Pumpkin Pie, Real Red, and Rich Razzleberry ink pads with an Aqua Painter. The banner greeting is from Friendly Phrases a great set yet it is about to be retired at the end of this month. To bring it all together I arranged bits and pieces from my stack of Summer Smooches DSP scraps, a snipit of Pool Party ribbon, and a Tea Lace Doily. 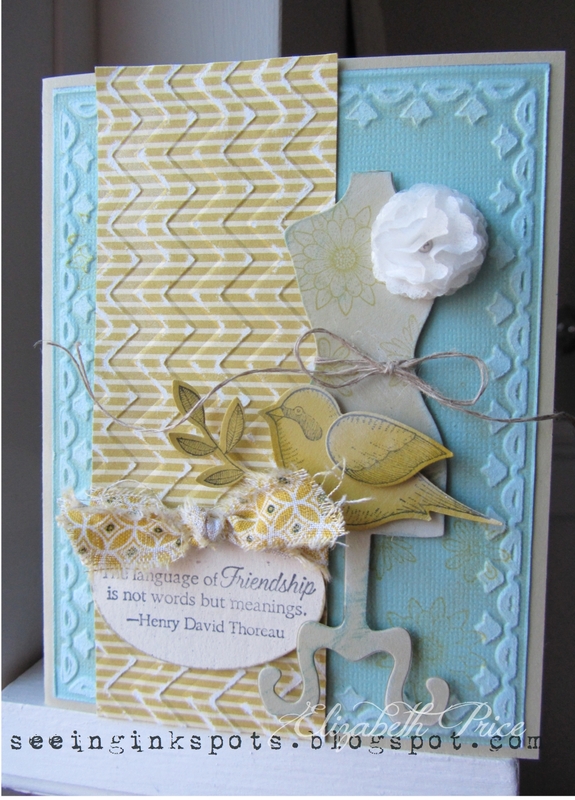 I was in a very textural mood when I put this card together for Hand Stamped Sentiments color challenge #159. I started with the colors listed in their challenge and when I gathered my card stocks, papers, and inks and had them laying flat on my work surface I could see I was right on track for the challenge. Then I made the pinwheels and the back sides of the DSP didn't quite meet the challenge. As you can see I kept them, cuz I liked them, and so I guess I failed the challenge by adding a touch of Island Indigo and Lucky Limeade. We made these boxes at my last "Bundle Bash" stamp night and boy are they gorgeous! We wrapped the kraft boxes from Stampin' Up! with a band of Comfort Cafe Designer Fabric and a festive bow created from the the Pop Up Posies kit. The band and bow easily slide off so you can tuck in precious gift and then present your present in style. 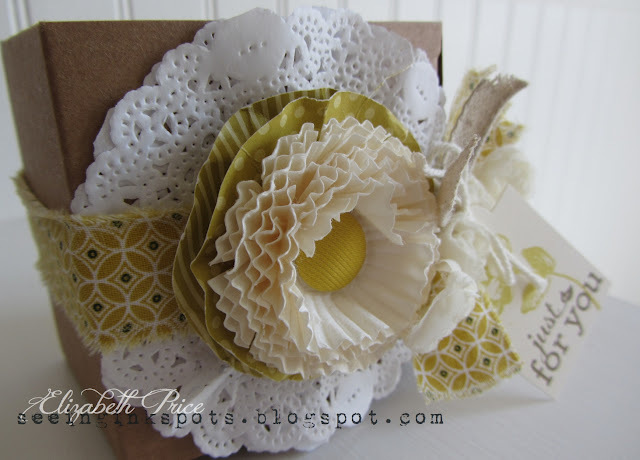 For the bow there are scrap layers of Flower Ribbon Trim, Natural Ribbon, more fabric, and the Bakers Twine from the Pop Up Posies kit. 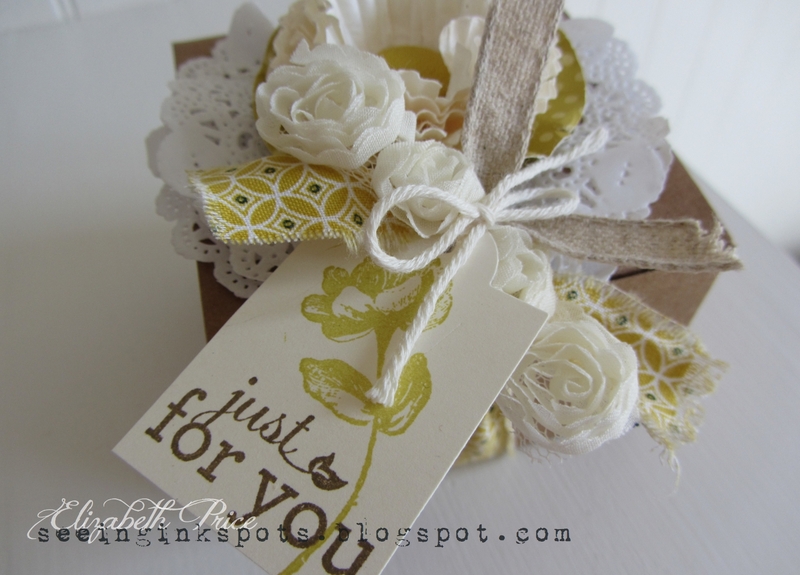 The greeting on the tag is also from the Pop Up Posies kit and the rose image is from the awesome set Oh, Hello.